We’re well into the second half of 2018 and so far we’ve been plenty busy checking out all of the exciting, new cafes swinging their doors open. Since these purveyors of brilliant food have been keeping us so well fed all year, we thought we’d look back on some of the cafes that we can’t help but go back to again and again. Carved into a corner of the Valley’s home of boutique furniture, Coco Republic, the fine folks at L’Americano are proud fans of The Talented Mr. Ripley with their glamourous Italian Riviera inspired interior. We like Matt Damon films too, but we love casual Italian food and quality coffee. The incredible atmosphere is plenty inviting but it’s their signature soft boiled eggs on artisan toast with your choice of avocado mash, smoked ocean trout or roasted eggplant that keeps us coming back for more. 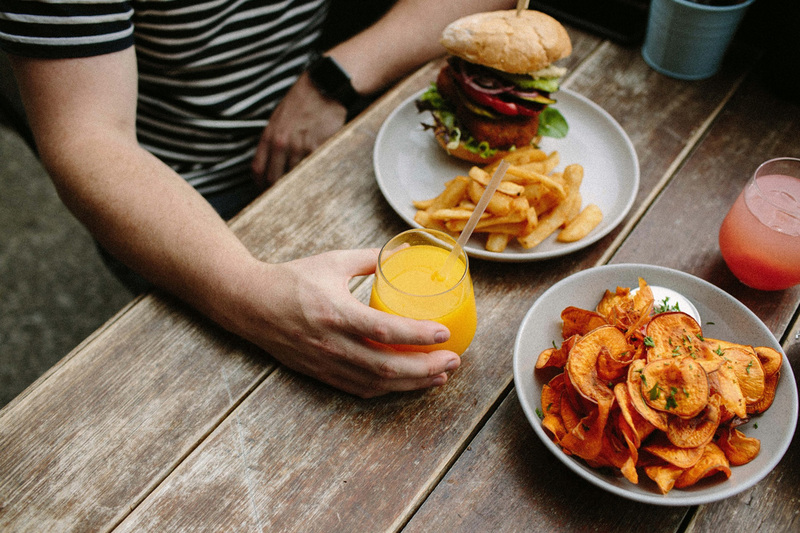 The ravenous new venture from former Moose and Gibson owner, Danielle Watts, Where the Wolves Eat have made it their mission to permanently change the standard of breakfast food in Brisbane and we’re more than happy to come along for the ride. Featuring a stacked menu of equally mouth-watering suggestions, we just can’t go past those Wolf Country Pancakes: savoury pancakes topped with spring onion, jack cheese and bacon with pork and fennel sausage crumble and drizzled with chipotle and bourbon maple syrup. Start your day with some classic avo on toast or rise above the rules of adulthood and go straight for the apple pie. Just be sure to pair your dish with a signature brew from The Black Lab Coffee Co.
Having conquered the Central Coast of New South Wales, Glee Coffee Roasters dominated regionals and advanced to nationals with the opening of their South Brisbane café and one sip is enough to have us bursting into song. Roasting and baking on site, it’s no wonder that Glee has already built a community of coffee drinkers with their chill vibe and incredible coffee that makes it well worth getting off South Bank’s main drag for a cup. Not content with just one great café in Brisbane, Monica and Jimmy Strong (the pair behind Artie and Mai) launched Macho Macho in early 2018 and, just like its ambitious owners, has no intention of being just another café on Brisbane’s ever growing list of coffee spots. Sure, you could settle for the classics, by we recommend trying the Beetroot Cured Salmon Gravlax with a poached egg, avocado, roasted cauliflower, baby beets and hollandaise sauce. If you’ve eaten too many breakfasts at this stage of the list, wait until the sun goes down when Macho Macho transforms from café to bar with a rotating selection of beers on tap. One of the brightest roasters to come out of Brisbane, Parallel took the leap of opening a flagship café this year and they couldn’t have picked a better spot to do it. Albion’s quickly becoming the place to be for cozy, chill café dining and the image of an afternoon sipping divine, batch brewed filter coffee against the leafy backdrop of suburban Brisbane is so inviting that someone should paint it! Or experience it yourself by checking out Parallel as soon as you can. Back in May, Alphabet expanded their bakery brand into a fully fleshed-out café in West End, emphasising sustainable food sources and supporting local, ceramic artists. You can now complement your perfect cinnamon doughnut by pairing it with a piping hot cup of coffee. 2018 has been a banner year for awesome, new cafes in Brisbane and we can only hope that they’re not done yet!